I'm a 46 year old female, out of shape and never ran before. My goal is to get in better shape and I want to be able to run my first 5K in less than 6 months, that is if that is possible. My health is good, no medications. I do walk 3-4 times a week for at least 30 minutes each time but no other exercise included. I need some guidelines of how to accomplish this task, I don't care about how long it takes to finish the 5K...I just want to be able to complete it. Thanks for your question about getting ready for your first 5k. Many people like you get to this stage. Wanting to exercise, but not knowing how to start running. I would really advise you to start by doing run/walks. 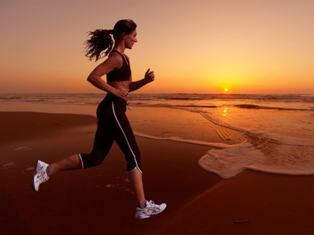 You already go out for walks, next time just add a minute of running. Just one. Next time, maybe walk 10 minutes, do one minute of running, walk 10 minutes, do one minute of running and walk another 10 minutes. Something like that. And just build up slowly from there. Good examples of this type of approach are available in my beginner running programs. You could use one of those running programs, or just make up your own by running and walking. This should get you ready for your 5k comfortably in time. In fact Beginner Running Program 3 gets you to run 30 minutes non-stop in 12 weeks, roughly 3 months. Most beginning runners run their first 5k race in about 30 minutes, some a bit faster, some a bit slower. So, what can I say, just go for it, start your run/walk program and you should be flying over the roads six months from now!